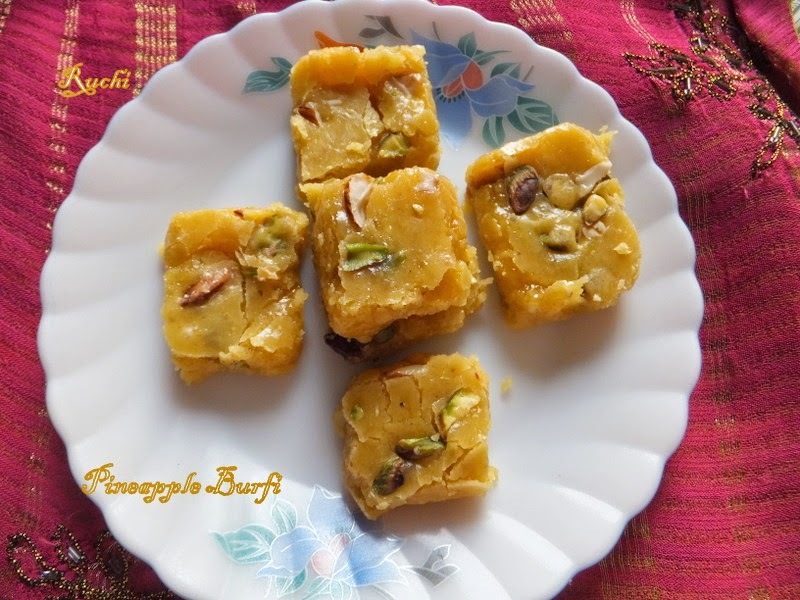 Pineapple Burfi is a simple and yummy fruity burfi with no fat and also looks great. It is very easy to prepare and gives you unique taste. I tried in my own version. 1.Grate the Pineapple and Grind it into a paste. 2. Sieve the besan | kadalai maavu to avoid lumps. Heat ghee in a heavy bottom pan. When the ghee melts and is hot, add the besan. 3.Roast the besan for 5 minutes till the raw smell goes and gives out a nice aroma then keep aside Grease a tray with ghee and set it aside. 4.Add the grated Pineapple paste to it and reduce the heat to medium. Keep stirring till no moisture is left. 5.Now Add sugar to it andKeep stirring for few minutes till sugar turns into thick syrup. 6.Add besan slowly; keep stirring so no lumps are formed. Reduce the heat to medium and keep stirring. 7.Add the remaining ghee slowly while keep stirring continuously. 9.Transfer to a greased pan and Spread it evenly and set aside to cool. 10.Garnish with. chopped pistachios& Silvered Almonds.Then cut into desired shape& Serve.